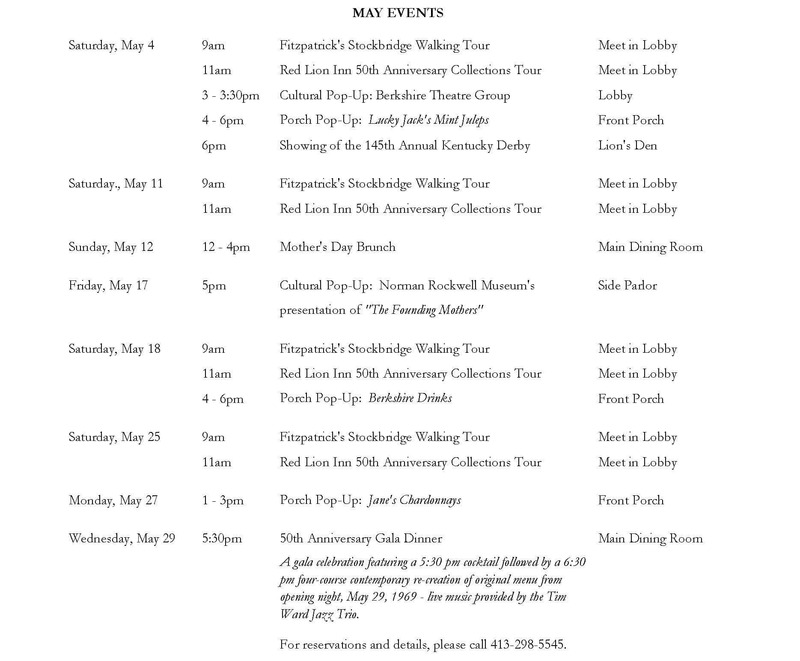 Join us for a 50-Day Celebration of the Fitzpatrick Family stewardship of The Red Lion Inn from May 4 – June 23, 2019 featuring special events, promotions and activities. 1969 was a pivotal year in American history; Apollo 11 landed the first men on the Moon, the nation was divided by the war in Vietnam; and in Western Massachusetts, a little town that time might have forgotten was experiencing a turning point of its own. Established in 1734 as an Indian mission, Stockbridge later became a popular resort destination during the Gilded Age. By the mid-1900s however, two World Wars, the introduction of federal income tax, and the Great Depression had left the future of this once-wealthy enclave in doubt. But 1969 breathed new life into the region with the creation of two significant cultural attractions – The Norman Rockwell Museum and Chesterwood – and the re-opening of The Red Lion Inn, one of America’s last great 18th Century hotels. 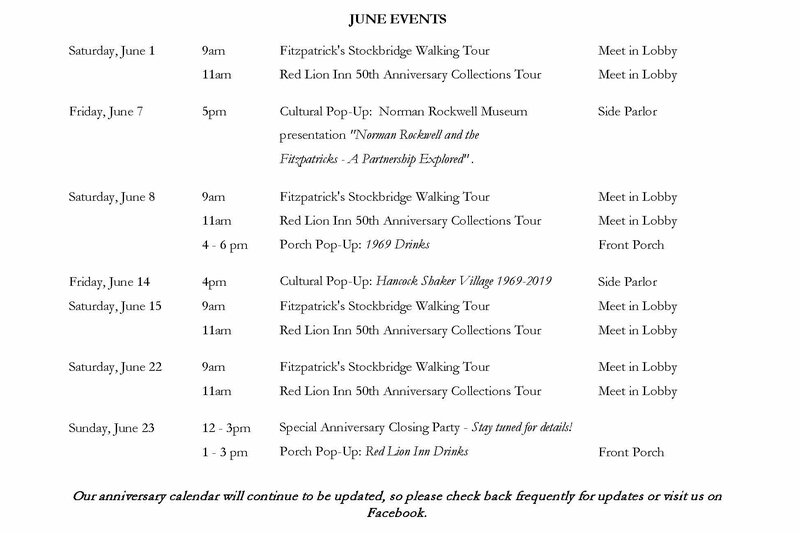 These events changed the course of history for Stockbridge, and helped usher in a new period of prosperity, with the Red Lion Inn the centerpiece of the renowned resort town. In 1956 Jane and Jack Fitzpatrick had moved to Stockbridge with their two daughters and their fledgling business, Country Curtains, a company that would prosper and become a centerpiece of the community for the next 50 years. As Country Curtains became more successful, the Fitzpatricks invested more in their local community and, when The Red Lion Inn was set to be razed in 1968, they stepped in and saved it. The Fitzpatricks began a significant renovation and re-opened the Inn on May 29th, 1969, having preserved most of the art, antiques and furniture that are so essential to the Inn’s charm and remain a popular draw for visitors. The Fitzpatricks’ impact on the community continued to expand and they became ambassadors for the entire region, funding local projects of all sizes and leaving a lasting mark on their community. Jane and Jack Fitzpatrick have passed away, but their impact can still be felt throughout Berkshire County; and through the Fitzpatrick Trust, their generosity continues to nurture the region to this day. The Red Lion Inn is still a Beacon of the Berkshires, drawing visitors from all over the world and offering a haven of New England tradition to its modern visitors. Explore 50 Years of the Fitzpatrick’s ownership of The Red Lion Inn through memorabilia throughout the property.